Power of Thin is a hypnosis weight loss plan written by clinical hypnotherapist, Steve G. Jones, and author, researcher and health advocate, Frank Mangano. This book highlights how hypnosis and the law of attraction can help you achieve your health and weight loss goals. According to the authors these techniques work like a “magic bullet” so you can easily lose weight. The program centers on using the power of the law of attraction to enhance weight loss. All you need to do is change your thinking and follow certain guidelines in order to effectively lose weight. The law of attraction is based on the concept that we attract into our lives everything we focus on. If you want to lose weight you need to shift your mindset away from feeling unhappy or frustrated about your weight. Instead you should concentrate on positive things like enjoying healthy foods and improving your health. Sometimes the law of attraction doesn’t always work if you have unresolved negative feelings and emotions. In these situations hypnosis can help you overcome these emotional blockages because it works on a subconscious level. Hypnosis weight loss techniques are explained that allow you to reprogram your subconscious so it is in harmony with a healthy lifestyle. You can also use hypnosis to enhance your motivation to prepare healthy foods, exercise and make positive daily choices. Once your mindset has changed you need to know which foods will best support your weight loss goals. You are encouraged to eat seasonally and locally while emphasizing fresh and unprocessed foods. Also you should eat as much organic food as possible. It is recommended to avoid all processed and fast food including soft drinks, diet soda as well as non-organic animal products. You should also switch from white bread, pasta and flour to whole grain alternatives. While it is best to limit alcohol intake, a little red wine is fine. It is suggested that you practice awareness every time you are faced with a choice about what you are going to eat. Consider what the entire experience of eating the food will be like. This means not just how it will taste but also how it will affect your body and wellbeing after you eat it. Vegetables, fruit, wild Alaskan salmon, sardines, organic eggs, grass-fed meat, free-range poultry, organic yogurt, soymilk, chickpeas, pinto beans, lentils, almonds, cashews, pumpkin seeds, whole-wheat bread, brown rice pasta, steel cut oats, quinoa, basmati rice, coconut milk, extra virgin olive oil, agave nectar, green tea. You can use hypnosis weight loss techniques and the law of attraction to increase your motivation to exercise. Focus on what you love about exercise and the benefits it has that can enhance your life. Choose activities that you enjoy and don’t push yourself too hard at first. You might consider doing yoga, Pilates, running, basketball, martial arts, dancing or walking the dog. Stretching is also important because it helps prevent injuries. 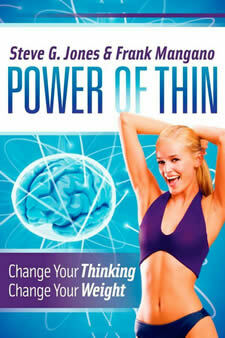 Power of Thin: Change Your Thinking Change Your Weight retails at $19.95. Encourages the intake of fresh, unprocessed and organic foods. Offers a unique approach to weight loss. Includes hypnosis weight loss techniques to help reprogram eating behaviors. Relevant to those who have had difficulty staying on a diet. Some people may require private counseling or hypnotherapy sessions to get results on this program. May not appeal for those looking for a basic diet and lifestyle prescription. Power of Thin incorporates the principles of the law of attraction, positive thinking and hypnosis weight loss techniques to enhance your ability to lose weight. This is combined with nutritional advice and recipes to create a holistic approach to weight management.